RUSH: We’ve got a couple stories today which document media behavior. This is unprecedented. I don’t think in my lifetime I have ever — and I’ve lived through the hatred of Richard Nixon and the hatred of Ronaldus Magnus and the hatred of George W. Bush. I have never seen this. I have never seen the out-and-out lying, knowing lying, the purposeful lying, mass lying that has been the namesake of the Drive-By Media since the election. A lot of people have been documenting a whole lot of things the media’s been saying and comparing them to what Trump actually said. How many of you think Trump said that there were nice people, some fine people in the Alt-Right and Antifa? Do you know he never said it? He never said it. He never said any of the things that have been reported and rereported and recycled, literally things made up out of whole cloth. It would really be wise for all of you to not believe a thing anybody in the media says about Donald Trump if it is the slightest bit critical. What they’re on today is, “Trump doesn’t care. Trump doesn’t care about people. Trump doesn’t love people. Trump doesn’t have empathy.” They’re just making it up. There isn’t any evidence. Trump has not been aloof. He has not been off-putting. They’re just making it up. They are literally making it up as they go. They are making it up according to the stereotypes they have established that are supposedly attached to Republicans or conservatives, right-wingers or whatever. They’re just making it up. And I don’t know how this is dealt with. Trump, in his speech, in his Phoenix rally, tried to deal with it for 30 minutes. He ran through, he had it written down in front of him. “Here’s what I said,” and he castigated CNN and the New York Times, and he was dead right. He was a thousand percent right in what he said. And look how they treated that? They of course, “This man is insane. This man is unfit for office. This man is unhinged. This man is delusion.” It’s the media that’s insane. It’s media that’s deranged. It’s the media that’s unhinged, and it’s the media that is just out-and-out lying. They’re not even trying to be subtle about it and they’re not trying to be trickery about it and using any trickery or any deception. They’re just blatant in-your-face lying, and they are counting on the fact that most people are not gonna know and are not gonna find out. They’re not even being subtle. They’re not even trimming things around the edges. They are just bold-faced making it up, in case after case after case, particularly Trump’s comments after Charlottesville. There’s also a great piece today in The Federalist. These are all long pieces. I mean, they print out to 15 pages. I can’t go through all of it. But there is a tremendous summary at TheFederalist.com on how there is to this day not a single shred of evidence that there was any collusion between Trump or anybody on his team with the Russians having to do with the election in 2016. To this day, there is not a shred of evidence. There’s another story that points out the intel community inside the Beltway, deep state, whatever you want to call it. If you disagree with them, no matter who you are, you are immediately tagged as a conspiracy theorist. The intel community is demanding 100 percent fealty. And if anybody strays, if anybody doesn’t believe, then the intel community launches into them, via the media, with the ongoing effort to slander or discredit, you know, any number of things. There isn’t any evidence for. There’s no evidence yet whatsoever. And it’s gonna come back as soon as the hurricane story winds down, which it will at some point when the Drive-Bys figure that they have maximized whatever they can get out of this story. They talk about Trump has no empathy. They talk about Trump doesn’t care. Who’s using who here? What does the media do when a disaster comes along? Who uses who here, and for what end, for what purpose? So when they’re through with this, when they think they’ve gotten as much out of this as they can for whatever purpose. But I guarantee you it’s not gonna be patriotic, it’s not gonna oriented toward making America great or making America look great. The focus on Houston’s gonna be what’s wrong with Trump, what’s wrong with America, what’s wrong with charities, what’s wrong with this, why didn’t people believe climate change. It’s gonna be nothing but a negative charter. They’ll eventually get tired of it, they’re gonna get back to this Russia business. But I’m not kidding you. RUSH: I’ll tell you what I actually think. There’s a lot of hope here, I will admit. But I think that the media is setting itself up, as are many groups on the left, for a backlash that they’re not gonna see coming. What I mean by this, there’s already growing fatigue with everybody under the sun being a racist. I mean, it’s more than growing fatigue. There is genuine repulsive anger. People are fed up with it. And I’m talking about people who are not accused of it. I’m talking about average, ordinary Americans watching the news, listening to everybody in the world be called a racist or a neo-Nazi or a white supremacist, they’re fed up with it. The point is they’re not believing it. Not that a backlash is gonna stop them. See, that’s the thing. Nothing that happens is gonna stop the media from doing what they do. So they’re always gonna have some degree of effectiveness because there’s always gonna be a certain percentage of the population which, for whatever reason, is gonna believe everything they see, read, or hear in the media. But it’s gotten to the point here that more and more people are questioning it. More and more people are beginning to have problems with it because it’s just every day. It’s Trump did this, Trump’s doing this, Trump’s horrible here, Trump’s horrible there, Trump doesn’t care about people. At some point, even if you hate Trump, you run out of your ability to soak it all up and believe it. People who hate Trump will have a lot bigger reservoir for it than people who are ambivalent. And people who like Trump are gonna have no patience for it whatsoever. And the number of people that like Trump is not shrinking, contrary to what the Drive-Bys would like you to believe. RUSH: Let me get to these examples of the media literally making it up about Trump. The New York Times has had to issue four blatant corrections. But that’s just the tip of the iceberg. We have here a montage — actually play number one too. This is from last night on C-SPAN. They aired a panel discussion of the American Bar Association about the Trump administration and its relationship with the media. They had our old buddy Jim Rutenberg, who is now the media columnist at the New York Times. He was on the panel. He had some things to say. Now, Rutenberg is one of the few reporters at the New York Times that has been fair. No, that kind of launches me into another area. That’s the wrong word. That’s the wrong word. The media claims it’s fair to do this or fair — That ought not be one of the ways in which the media, “Is it fair, was that a fair report, was that a fair.” I’ve always been bugged by that. Rutenberg has never misquoted me. Rutenberg has never put words in my mouth. And he has never lied about me. He’s never accused me of saying things I didn’t say or any of that. But nevertheless, he is a standard issue New York Times journalist. So he’s on this panel, and it’s incredible to get their perspective on things. Remember Rutenberg, now, is the media columnist, so he’s like the Howard Kurtz. What he writes about is the media and how they’re doing their jobs and all of that. And this is what he said about the media and Trump. RUTENBERG: There has also been a sustained campaign to undermine the press. It’s several decade old, at least four or five decades old. And its intention is to discredit us, and it happens nightly on Fox News with the biggest cable news audience. It happens daily with Rush Limbaugh, with the largest radio audience. The press cannot — we don’t campaign back on our job. Our job actually is to piss people off sometimes, and so, you know, we are the messenger, and that’s not always a face that people want to see when it’s news that they disagree with or it’s bad news for their political side or what have you. So we’re kind of not in the business of being liked. RUSH: Oh, Jim, but you are. You are most certainly in the business of being liked. You wanted to be loved by Obama, and you wanted to be loved by Bill Clinton, and you wanted to be loved by Hillary, and you wanted to be loved by Michelle (My Belle) Obama. You wanted to be loved by all these people on the left. There’s no question. You people in the media, you want to be in the club. You want to be in the establishment. And you know whose bread you have to butter to do that. By the way, just as an aside, it wasn’t all that long ago — there isn’t a New York Times reporter in the world who would ever have said the word “piss” in a panel discussion with the American Bar Association. I’m not being critical of Rutenberg. It’s just a sign of our culture and where it’s headed. And by the way, Rutenberg’s not the only one. I refuse to use the word, but it’s common. I mean, you’ll hear it commonly expressed on Fox News. You’ll hear it on CNN. And I have standards, ladies and gentlemen. I attempt to maintain those standards each and every day. We don’t always meet the standards, but we try. But here you have an august panel, the American Bar Association, and they’re the kind of guys that could piss you off. (laughing) Seriously. My grandfather would be appalled. He would simply be appalled. To him the American Bar Association was the Supreme Court. He so valued being a lawyer that an association of lawyers should have been the greatest representation of all of humanity. That’s how much he respected the law. Anyway, Rutenberg says that there’s a campaign to undermine the media that is several decades old to discredit the media. I think all of this, Jim, we’re simply defending ourselves. I mean, if you want to look at who got this ball rolling, I mean, it’s you guys. I was minding my own business one day and then I became a talk show host. And six months after I became a talk show host I became a racist and then I became a sexist and then I became a bigot and then I became a homophobe. All of that was said about me in the media, but before I ever got a radio show nobody ever said any of that stuff about me, nobody thought that about me, nobody accused me of any of that until six months after I got a radio show. And then it was, “Katie, bar the doors.” That’s what I have been in your media, Jim, ever since you guys first heard of me. So what am I supposed to do, just sit here and laugh at it and take it? And I’m by no means the only one. Obama was the biggest cold fish wrap. Obama was not warm and fuzzy. He was a cold, cold, calculating guy. And Bill Clinton could fake sincerity and fake sympathy and fake empathy like nobody. But before Trump even got to Texas, “Trump is such a pig. Trump such boor. Women are repulsed by Trump. People don’t want to be anywhere near Trump. Trump probably smells. Trump probably stinks. Nobody is gonna want to be hugged by Trump.” That was what they set up, and here’s a montage of them attacking Donald Trump yesterday, last night, and this morning. DAVE BRIGGS: (outdoor noise) People want to see empathy from this president. It is certainly not his strong suit. JEFF ZELENY: (outdoor noise) …very little in terms of empathy from this president. DAVID AXELROD: (b-roll noise) … the dimension of empathy. He just can’t get there and be that empathetic leader. NICHOLAS CONFESSORE: The empathy part is one that the president struggles with. ARI FLEISCHER: There was something missing; that’s the empathy for the people. PAUL BEGALA: Empathy. That’s, to me, the soul of morality. EDDIE GLAUDE: …whether or not President Trump exhibits empathy. ARI MELBER: Did Donald Trump have his empathy moment today? EVAN SIEGFRIED: He didn’t have the empathy moment. MATTHEW NUSSBAUM: He didn’t really show a lot of compassion or empathy towards the victims. KENDIS GIBSON: (newsroom noise) Critics accuse him of not showing any empathy. 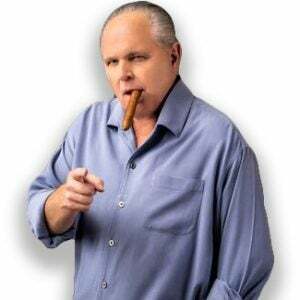 RUSH: A lot of Never Trump conservatives in that montage, folks, a lot of them. It wasn’t just Drive-By leftist media. There were some Never Trump conservatives here. Now, who sends the memo out that says, “The word for today is ’empathy,’ and the point is that Trump hasn’t got any”? How is it that so many people on so many different networks end up saying the same exact thing? Is it that they all think exactly alike? Which is a distinct possibility. How do they know? Where is it written that what victims of a disaster want is empathy? How about victims of a disaster wanting results? What good does empathy do you? At the end of the day, what good does it do you? By the way, I’m not conceding that Trump doesn’t have it. I think it’s just the exact opposite. This is what they don’t get about Trump. While Trump was at the fire station yesterday and he was going through his rah-rah and rally and talking about how great Texas is, and, yeah, it’s bad, but these people are Texans, and Texans can handle anything. When he said that, he then looked, said, “What a crowd, what a crowd, what a great –” and so the media, “This guy thinks it’s a rally. This guy’s looking at it like people came out to see him.” They blew their gaskets. ‘Cause they just don’t understand the guy, and they make no effort to understand Trump. They don’t understand his tongue-in-cheek humor, and they have no desire to. Anything or anybody that doesn’t behave according to the code book for inside the Beltway is a lost cause. It’s funny to watch. President Trump’s commenting on the crowd, great crowd, and he’s waving at them and so forth, and it just offends them all to hell. So they double down on the fact that Trump has no empathy. We heard our first caller. I don’t mean to be insensitive here, but at the end of the day, why do we think presidents have to be empathetic? It’s because that’s what the media has shown us. We have phonies like Bill Clinton who show up at disasters and hug people and fake tears with ’em and so forth. “Oh, he cares, oh, my God, did you see that?” The media has a cow, “He cares so much, oh, wonderful.” Meanwhile, what got done? In the meantime, we have a president who is a builder. What is going to be needed in Houston and southeastern Texas? Building, rebuilding, construction. We have a president who comes from that area of life and knows it and is an expert in it. Infrastructure, if you will. The idea that a citizen or a group of citizens in a disaster can be calmed and satisfied by empathy from a president? You watch. I’m gonna be said to have no empathy because of these comments. But as the mayor of Realville and a supreme realist, I mean, yeah, I guess it can make people feel better, but really? Empathy, sympathy — I think they’re not even talking about empathy. They’re actually meaning sympathy. And what they’re saying is that “Trump doesn’t have the ability to feel sorry. He doesn’t have the ability to put himself in other people’s shoes. He just doesn’t care. Trump doesn’t care about people.” And of course that’s the meme the Drive-Bys are continuing to play and the Democrats are playing class envy in the eventual rebuilding. John King at CNN reacting, I think — you heard this montage — it was just a never-ending drubbing of Trump and his lack of empathy. This afternoon at CNN on Inside Politics, I had to read this transcript twice, because this seems so out of place for CNN. And it made me wonder, does John King know that his days there are numbered? Listen to this and see what you think. KING: It was striking to me that even in the middle of this visit to Texas, to go to a state in the middle of a disaster, if you look at social media and elsewhere, Trump is in the eye of the beholder. There was this big political debate even before he hit the ground. As they were leaving the White House, whether it’s Melania’s shoes, the president’s hat, and then what he said, did he show enough empathy. Can there not be a “the president went. It was appropriate for him to go. He stayed out of the way, which is the smart thing to do. He got a briefing. He knows more today than he did yesterday”? Why do we get immediately into the muckety-muck? RUSH: Whoa! That obviously wasn’t on the teleprompter. Nobody at CNN would have put that on the prompter, so that was from John King’s mind and heart. “Can we just not report the guy went, he stayed out of the way, he got a briefing, he knows more now than he did — can we just do that? Why do we have to get into the muck?” Wow. Of course, they could ask themselves that every day, but the fact that it was asked on CNN, hmm. I’m telling you, there’s some things going on here, if there’s anybody in the media that’s responsible — and that’s a big if — but if there is, folks, there have to be some people troubled by what this business or industry is doing, led by the New York Times starting with this whole Russian-Trump collusion story that there is no evidence of, zilch, zero, nada. I mean, there’s not a shred after all of this time. The outright lies the media told about what Trump said after Charlottesville in his three separate statements, they lied about all three. There are people in the media who know this. Are there people in the media troubled by it? Well, you would think that in any group of people there can’t be total unanimity. Gotta be some strays. Not everybody thinks the same about everything. Except when you get into liberalism, it pretty much is rote.